High-Speed Single Port RS-422/485 Serial PCMCIA Card (up to 921.6 Kbps). Provides a reliable solution for Notebook to connect various RS422/485 peripherals. This quality PCMCIA serial card adds two serial ports (RS422/485) to Notebook Computers. Supports echo mode to help software determining unexpected bus collisions. Supports data at speeds up to 921,600 bps. Backward compatible with 16C550 UARTs. - 128-byte 16C950 Deep FIFO Performance. 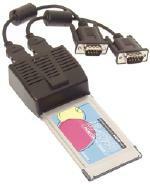 Supports 2 RS422/485 Serial Ports with a DB9M Cable. Selection of if you want to use the card in RS422 or RS485 mode along with other settings can be made via dip switches on the end of the card. Provides 2 DB9-Male RS232C serial port connector with a 15-pin to DB9M cable. Uses a 68-pin PCMCIA (type II) connector for notebook computers.